You may not believe believe in ghosts, but you're not alone if every now and then you're "too lazy" to turn the lights off. The world is a wild and spooky place, after all, and it's not your fault your friends pressured you to use that ouija board back in sixth grade. As of this month, you can find out exactly how paranoid and deluded you are relative to the average American citizen. 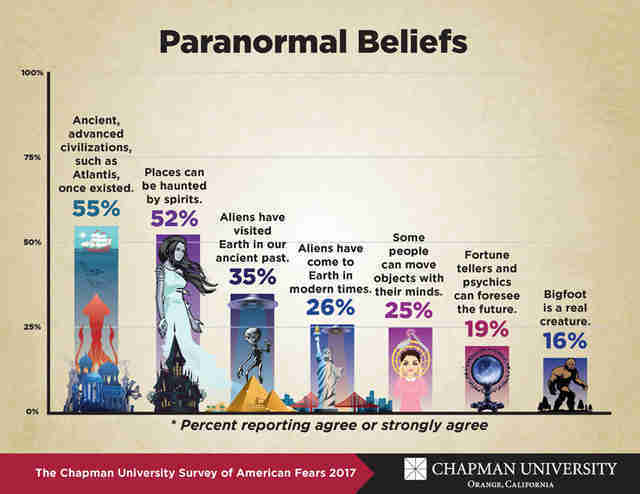 Chapman University released the results of a survey of 1,207 random Americans on various paranormal beliefs, and the results might be unsettling, depending on your thoughts on Atlantis. Check out this handy chart the researchers put together. Leading the pack here is the belief that "ancient advanced civilizations, such as Atlantis existed," with a shocking majority of 55%. This is closely followed by the 52% of Americans who believe that "places can be haunted by spirits." Dragging behind like always, Big Foot brings up the rear of the paranormal parade with a mere 16% of Americans believing in His Hairiness. According to the report, researchers found that "only a fourth of Americans (25.3%) do not hold any of these seven beliefs. 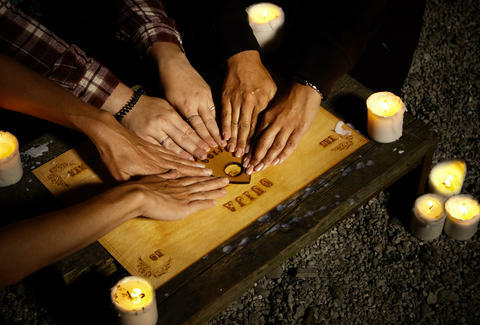 However, this means that nearly three-fourths of Americans do believe in something paranormal." The real take away here: Let's start the Big Foot Awareness campaign he deserves. James Chrisman is a News Writer at Thrillist who is very smug about his skepticism. Send news tips to news@thrillist.com and follow him on Twitter @james_chrisman2.